Jonas Craft is dead, nothing left of him but grimy ash and a charred stake. His coterie's eyes have turned on his neighbors: you. Do they seek justice or something else? Is Jonas' murder an isolated incident or just the tip of the iceberg? Why have the living suddenly taken an active interest in a safer, cleaner neighborhood? Just who killed Jonas Craft and what did they want? When answers lead to more questions, only one question matters: Are you next? 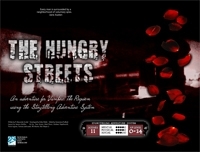 The Hungry Streets contains a collection of scenes, handouts and a number of hyperlinks to various portions of the text as well as bookmarks, so you can always jump right to what you need with just a click. It also has a resource tracking sheet, and an interactive map that works for both players and Storytellers.